Doctor Who: Sonic Reducer | Warped Factor - Words in the Key of Geek. Not even the sonic screwdriver can get Christopher Morley out of this one! Think of the defining elements of Doctor Who and it probably won't take long for your thoughts to drift towards a certain handy sonic device which the Doctor has kept about his person since his Second incarnation- the screwdriver having made its début in Fury From The Deep! JAMIE: Will it not budge? DOCTOR: No, it won't touch it, I'm afraid, Jamie. Ah well, have to use this. 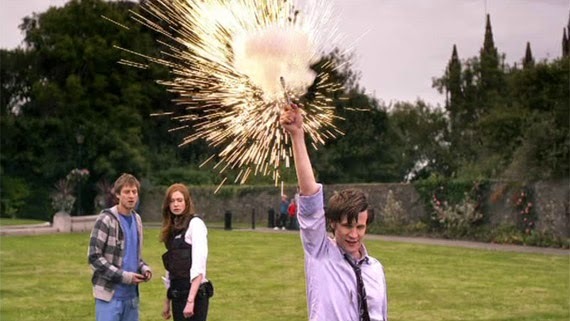 DOCTOR: It's a sonic screwdriver. Never fails. Several later incarnations also kept hold of it for obvious reasons, until, that is, the Fifth Doctor finds himself present for the Great Fire of London in the pseudo-historical The Visitation - when its destroyed! Of course we know why it happened on screen, don't we? LEADER: Drop the sonic device. DOCTOR: It isn't my day, is it? I feel as though you've just killed an old friend. LEADER: It is with some sadness that I tell you you are about to join it. DOCTOR: Why not smile and let me live? 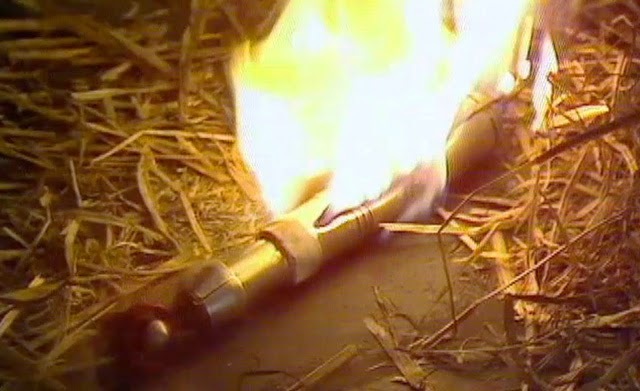 And it would seem that several of his predecessors in the producer's chair pressed to lessen its use during their tenures- Barry Letts the first to cut it out unless absolutely necessary, as in The Sea Devils, when a redesigned model is used by the Third Doctor to remotely activate mines. And a similar attitude was adhered to by Letts' successor Philip Hinchcliffe during his time working on the Fourth Doctor's early years, though it is used in Tom Baker's maiden outing, Robot, for much the same purpose as in the aforementioned Sea Devils. After Hinchcliffe was replaced by Graham Williams it made a comeback! "The sonic took on the life most producers had feared. It had become the perfect MacGuffin, used to get The Doctor out of every corner the writers had written themselves into." A similar concern to those of the man who'd ensure its destruction, you'll note! "John Nathan-Turner felt- and I think I agreed with him, actually- that it was an answer to everything." And he would go on to attack New-Who for what he saw as an over-reliance on the gadget that he himself had used up until it was dismissed! "It is now, and I think it's suffering a bit from that. I mean, what can't the Sonic Screwdriver do? It seems to be able to do absolutely anything... with the exception of, and this was a plot thing, open wooden doors. So, that was his feeling- that The Doctor ought to operate on his own initiative and his own sort of, you know, things he might have in his pocket rather than just one device that would just do everything." Post-Visitation, barring a brief cameo in the Eighth Doctor's TV film appearance we'd have to wait until the Russell T Davies revival in 2005 to see the Sonic Screwdriver again, with yet another redesign! It had returned to what most would consider its rightful place, alongside the Ninth Doctor. 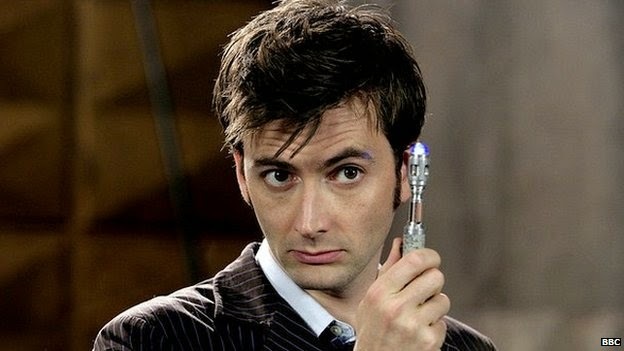 JACK:: Who has a sonic screwdriver? 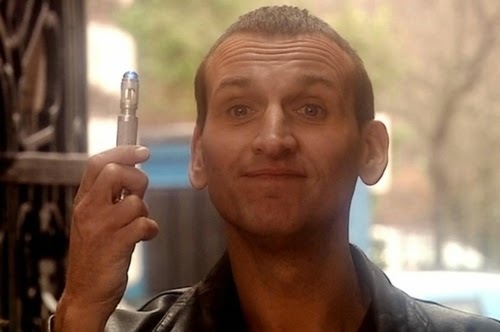 JACK: Who looks at a screwdriver and thinks, hmm, nice but could be a bit more sonic? DOCTOR: What, you've never been bored?... Never had a long night, never had lots of cabinets to put up? "As David Tennant took over the sonic started to become more and more of an essential part of The Doctor's arsenal, and it's also when you start seeing it overused. Some of it was just flash, but by the time "Forest of the Dead" rolls around you start running into storylines that simply cannot be resolved without the sonic. It's a pretty big jump from being able to pick a lock to being able to store an entire recording of a person's consciousness." We might also consider that upon taking over as showrunner, Steven Moffatt toyed with the idea of it coming a cropper in The Eleventh Hour, in a sense! It goes kaput, and the Doctor is forced to go without until the Type 40 is sufficiently rejigged. "Oh! A new one! Lovely. Thanks, dear." Thanks indeed from the Doctor's point of view. But now that he's regenerated once more, might it be time to try going hands-free once more? Its certainly the subject of much debate. And having looked at the cons, perhaps its time to consider the pros! "If anything the sonic screwdriver discouraged lazy scriptwriting because it made it harder to justify putting the Doctor in an endless sequence of captures and escapes. It dramatically reduced the amount of stupid padding that could be shoved into a story, and it does so even more in its modern day version as a tool that can accomplish anything so long as it wouldn’t be more interesting to do it another way."